A Japanese robot that uses 5G to mirror the operator's movements in real-time. In a shared network, multiple mobile operators share a common last-mile access infrastructure, including masts, antennas and radios, while each continues to operate an independent core network. At the heart of infrastructure sharing is a delicate balance between cost savings and competition. From the early years of mobile, regulators favoured competition to stimulate the development of a nascent market. Regulators issued two spectrum licences for first-generation networks and, as more spectrum became available over time, they enabled additional operators. Today, it is common to have four or even five operators in a market. Standing on the cusp of fifth-generation (5G) networks, the situation is dramatically different from the past. In 2012, global mobile subscriptions grew 9% year over year while global smartphone shipments increased by 40%. 2017 marks the first year that new smartphone unit shipments did not grow at all, while mobile subscriptions grew at just 3%. To cover for slowing growth, mobile operators attempted, but largely failed, to monetize a surge in mobile network usage by consumers. For example, while the average number of minutes spent viewing video on smartphones increased by over 30% in 2017, mobile operator revenue grew by a fraction of 1%. At the inception of mobile when services were limited to voice and SMS, competition among operators focused on population coverage. 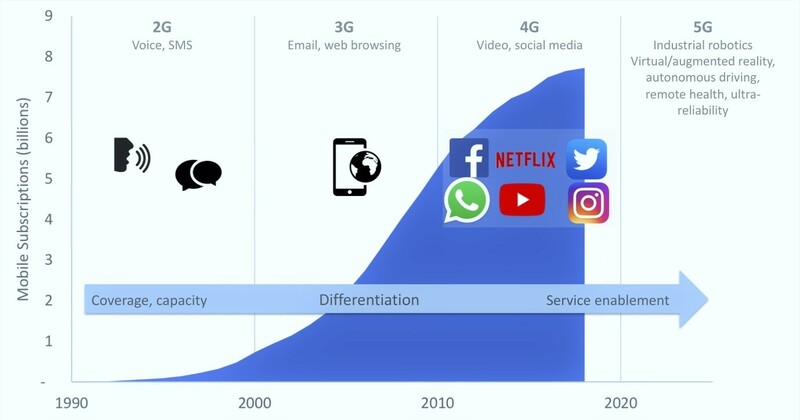 Following the introduction of the iPhone in 2008 and rise of 3G and 4G networks, download speeds and monthly data allowances, became the new benchmark of competitive differentiation between mobile operators. Operators spent billions to build out extensive radio towers – their crown jewels – and were not inclined to share that infrastructure. 5G promises to seamlessly provide different services to different types of users and devices at high speed, low latency and high reliability. It will also provide customers with tailored connectivity optimally configured for particular applications without impacting broader network performance. For instance, a 5G network might need to deliver hyper-realistic real-time virtual reality gaming experience to users while simultaneously delivering mission-critical public safety applications. The ability to simultaneously deliver agreed levels of experience, reliability, quality and security across a diversity of users is a function of the network software layer: it is what will set competing operators apart. Should network coverage and capacity remain the benchmark for investment and competition among operators in the 5G era? While operators will continue to invest and compete at the infrastructure layer both to maintain and upgrade existing networks, 5G will require a synergistic use of network infrastructure assets. Operators have to build the software layer that will define and differentiate their service capabilities. Competition between network operators based on coverage and capacity determined by infrastructure alone will not work for 5G. This new recipe to competition redefines the cost versus competition formula that guided regulators in the past. Consequently, sharing the physical radio infrastructure becomes less contentious, even necessary to make the cost of 5G networks manageable. Following an in-depth assessment of its 5G trial during the Winter Olympics in Pyeongchang, Korea Telecom estimated that on average 5G networks would need four times the amount of transmitters per given area compared to 4G networks. A major cost driver for 5G will be the need to deploy hundreds of thousands of kilometers of additional fibre optic cables under city streets to connect a vast array of mini-transmitters and antennas perched on lamp posts and buildings. To mitigate the adverse impact intensive investment would have on the financial viability of Korean operators, the Korean Ministry of Information announced in April 2018 that SK Telecom, KT Corp, LG U+ and SK Broadband would be allowed to share the cost of building a 5G network; saving an estimated $1 billion in capital and operating expenditures over 10 years. In its recent 5G Wireless Outlook, Morgan Stanley forecasts mobile operators will need to substantially ramp up network investment, reaching a total of $225 billion worldwide between 2019 and 2025. The prospect of higher investment requirements, in spite of flattening revenues, has raised market jitters and broadly depressed valuations of mobile operators, especially those in Japan and Korea where 5G could be first to roll out. The bulk of the investments to build out 5G will go into the radio network. Xona Partners estimates that 5G will require six times the investment to deliver comparable coverage to existing 4G/LTE networks. This is because 5G improves performance over existing 4G networks by getting closer to the user at the network edge in terms of antennas and computing power to deliver ultra-high definition video streaming, real-time interactive augmented reality and vehicle-to-vehicle communications for road safety. With differentiation shifting away from the expensive radio infrastructure to the to the software and service layer, there is greater need to collaborate among ecosystem players, including local and national governments, industry vertical, and civil society to streamline the 5G network buildout. Sharing activities will increase in the future. It is simply a matter of economics.